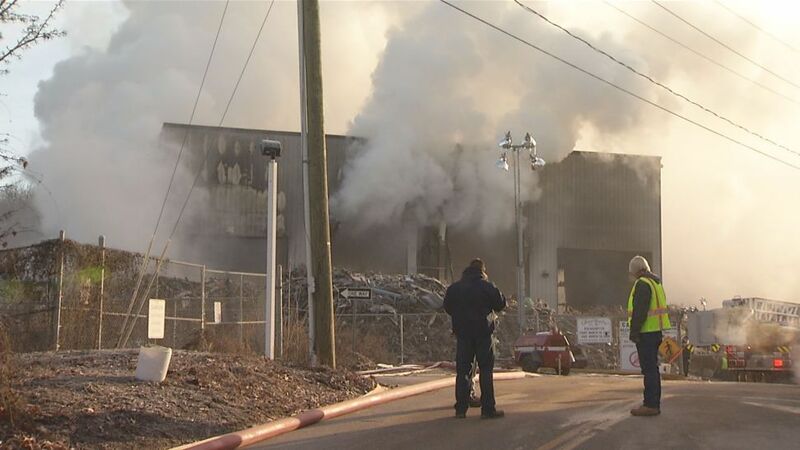 Firefighters remain at Calamari Recycling Company at 20 Dump Road off Route 154 in Essex after a large fire broke out on Wednesday and reignited early Friday morning. The fire initially broke out on Wednesday evening and continued to smolder through the day on Thursday. Officials said the fire rekindled just before 2:30 a.m. on Friday. Firefighters were able to extinguish the flames just before 5 a.m., but it is still smoldering. The facility sorts scrap metal and other demolition material and debris inside was acting like fuel for the fire. Firefighters and employees of the recycling facility have been working together to sift through that debris and extinguish hotspots. After the initial fire broke out, Lt. Aron Schumacher, of the Essex Fire Department said there was a lot of debris in the building and crews were working on getting it out. During the initial response effort, one firefighter was taken to the hospital when he tripped and hurt his ankle. Battling the fire has used a tremendous amount of water -- 1 million gallons. Much of it was trucked in - tanker after tanker and so much water was needed that Connecticut Water alerted nearby residents about the possibility of low water pressure or discolored water earlier in the week. Officials from the state Department of Energy and Environmental Protection brought in a mobile lab to test air quality on Thursday and advise people who live near the scene of the fire, especially those with respiratory ailments, to stay away from the smoke. First Selectman Normal Needleman said the initial results are negative for toxic compounds. Then, DEEP said tests revealed trace amounts of indicator chemicals in the building, but not at a level that would cause a risk to public health. Tests in town did not show anything harmful, while other samples are still being analyzed. On Friday afternoon, DEEP said test results from water samples showed very low concentrations of various organic compounds that they would expect to find after a large fire and it does not appear that water running off the site posed any significant risks to natural resources or public health. DEEP plans to return to this scene within the next few weeks to conduct more water quality tests. On Wednesday, winds carried the smoke over the river, which caused no air quality concerns because the smoke was carried to an unoccupied area. On Thursday morning, however, smoke was being blown over populated areas of downtown Essex. so they began testing for chemicals in the smoke. Concerns for waterways are minimal, according to officials from DEEP. The fire also impacted drivers throughout the afternoon and evening. Exit 4 off Route 9 North and a portion of Route 154 were shut down to traffic for hours. Ice was an issue for firefighters, with many hoses rendered unusable when they were frozen in place. In response, public works put down salt and sand to mitigate the impact.